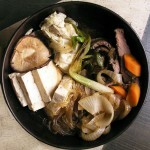 It’s easy to make Sukiyaki at home. 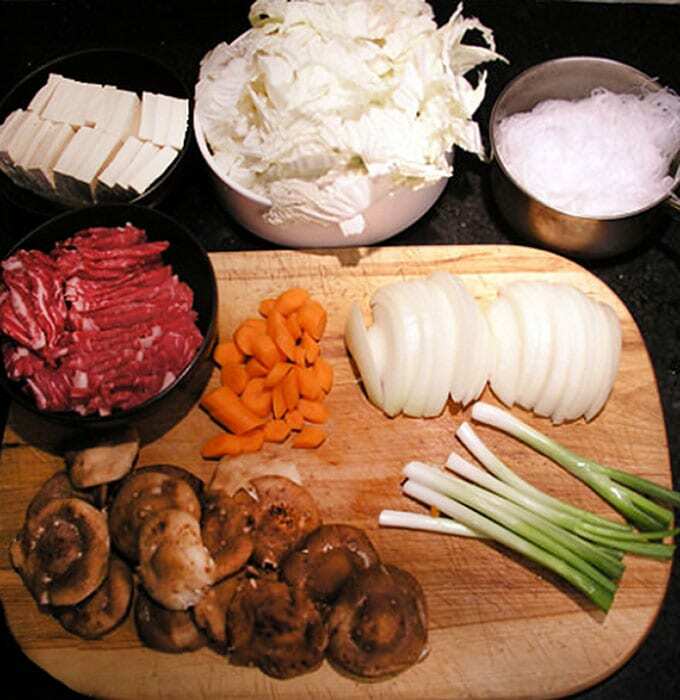 Just some slicing and dicing and ten minutes of simmering and you will have a delicious Japanese hot pot brimming with beef, rice noodles, tofu and vegetables, in a sweet soy broth. 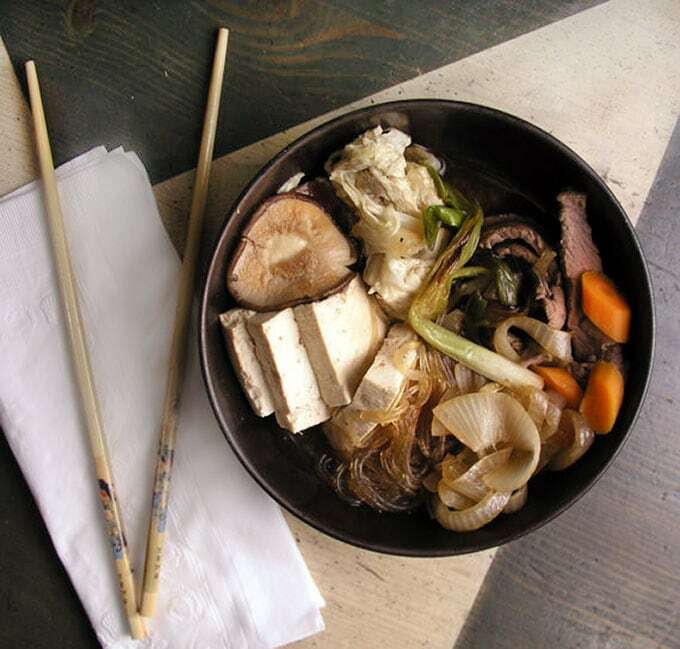 Nabemono or nabe is the Japanese term for hot pot or one-pot dishes and Sukiyaki is one of Japan’s most popular nabe dishes. It combines lots of fresh vegetables; tender tofu, and thin slices of beef, all cooked together in one pot, in a sweet soy-based broth. Slice and dice everything in advance and once the broth is simmering dinner will be ready in ten minutes. 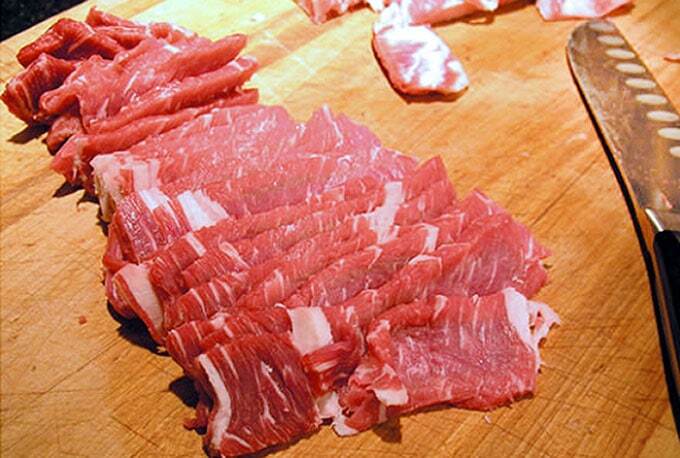 It is much easier to thinly slice raw beef after it firms up in the freezer for an hour or two. When the broth is ready, each ingredient is added to the pot in its own little pile. Don’t worry if things stick up out of the broth. Once everything is tucked into its own spot and the pot is simmering, you can nudge things down gently into the broth to make sure everything gets nicely cooked and tender. In japan the whole pot goes onto the table and diners reach in with chop sticks and grab what they want. One of the great benefits of a one-pot dinner, according to the Japanese, is that when people eat from a shared pot, it helps create closeness and warm relationships between them. If you want the authentic Japanese dining experience, know that It’s considered good manners in Japan to make loud slurping sounds when eating soup with noodles. It lets the cook know that you’re enjoying the meal. It’s also acceptable manners to lift your soup bowl to your mouth and drink the broth as if your bowl were a cup. 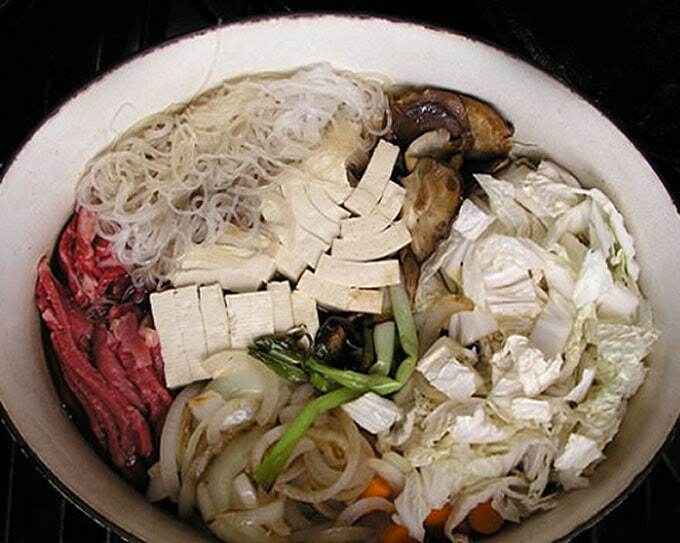 Here’s the recipe for Sukiyaki. If you try this recipe I hope you’ll come back to leave a rating and a comment. I’d love to know what you think! A sumptuous hot pot brimming with beef, noodles, tofu and vegetables in a sweet soy broth. 12–16 oz boneless rib eye steak, cut, across the grain, into very thin slices. (If you have time, freeze the meat for an hour or so to make it easier to slice) Set aside in the fridge. 1 14-oz Pack firm tofu, drained, cut in half lengthwise, then each long half cut into 9 or 10 slices. 1 4-oz package of Japanese cellophane noodles, soaked in hot water for 10 minutes to soften, drained and set aside. Have all ingredients washed and cut and ready – steak sliced – noodles softened. Put oil in a large skillet and heat over medium high heat till hot, but not smoking. Add sliced onions, scallions, and shiitakes (white side down), keeping them separate from each other, and brown them for about 5 minutes, using a spatula to move them around a bit so they all get some browning. Remove pan from heat and set aside. Put soy sauce, Mirin, sake, sugar, and 1 1/2 cups water in a large pot or Dutch Oven. Bring to a simmer over medium heat, stirring (1-2 minutes) until sugar is dissolved. Turn off heat and carefully place all ingredients into the pot in separate piles, starting with one corner of the pot. I like to start with the heavier things that will stay put: the sliced beef. Then the cubed tofu. Then the onion, scallions and mushrooms. Then the carrots. The cabbage is very bulky but will shrink as it cooks. Finally, clear a little spot, with a wooden spoon, to drop in the softened noodles. Turn the heat up to medium high. When it starts to boil, turn it down to a strong steady simmer and use the wooden spoon to gently jiggle the ingredients and nudge them down into the broth, without disturbing the piles, so that everything gets cooked. When the meat is no longer pink and the onions and cabbage are soft, about 5 minutes, the Sukiyaki is ready. 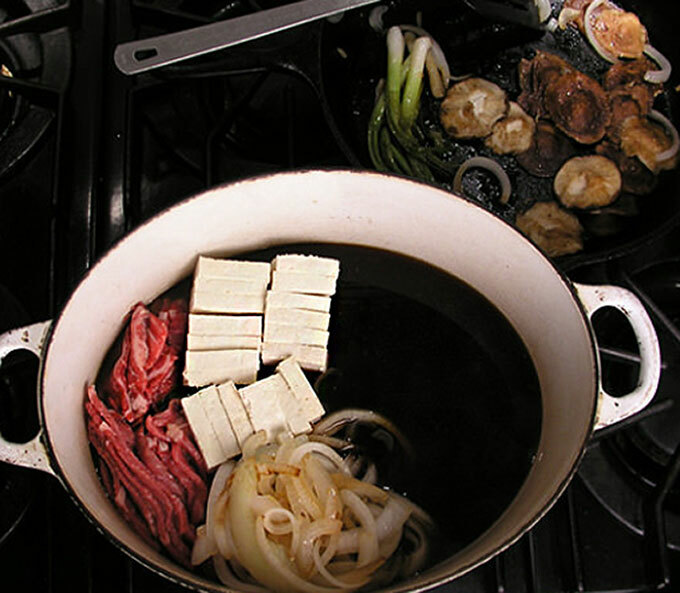 Divide the Sukiyaki into individual bowls, using tongs to make sure each bowl gets some of each ingredient. Spoon broth into the bowls. Enjoy! My wife made this the other day and the kids and I loved it! It tasted like I was back in Tokyo. Loved this one. Made it tonight. Used 1/2 lb more rib eye since I have a very protein starved teenager. Also added some spinach to the hot pot. KIds would have liked some more noodles. Going to use this for a ski weekend. Every little bit was gone. A super and fun family meal! Julius and I just made this for dinner last night and it was delicious. Thanks for the inspiration and the great instructions on how to do it! Delicious looking soup! And a nice step-by-step tutorial! would love to try making it. Thanks! Let me know how it turn out if you make it. PS Your website is beautiful!